Preserve Museum In Old Ladoga To Be Restored. In 2003 when St. Petersburg turns 300, Old Ladoga will celebrate its 1250th anniversary. More than 1,5 mln. rubles were allotted this summer for the preserve restoration from the presidential reserve fund. It is planned to spend 30 mln. 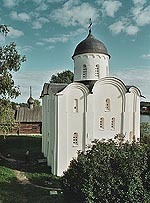 rubles from federal and local budgets on restoration of Uspensky and Nikolsky monasteries, churches, merchant houses and other objects. City news archive for 17 September' 2001.